Today I can show you little bits that I've done on my needle roll and also on the purses. The seams on the black are designs from Pam Kellogg. Remember me showing you the 'Secret Garden' book? piece of lace, with some french knots added. but I suspect it is handmade. Today's quote, attributed to Anais Nin: "Each friend represents a world in us, a world possibly not born until they arrive, and it is only by this meeting that a new world is born." overlooked in the third picture. things in the spirit of love." drawings (or whatever you like). Specs: 'Secret Garden - An Inky Treasure Hunt and Coloring Book' by Johanna Basford. Published by Laurence King Publishing Ltd. The most interesting pincushion I've ever owned!! Today's post is somewhat filled with pictures. Feel free to click to embiggin! things, you sort of forget the other kind." Ever have one of THOSE days where you spin your wheels and end up accomplishing nada? Today was one of those days. First of all, I DID spin my wheels and took the car out to do errands. Coming home I heard a rather ominous noise issuing forth from beneath. Not to worry...it's the accumulation of snow/ice around the wheel well, thought I. Rather wondered why a young guy wielding a shovel in his driveway looked rather aghast as I drove by. Oh well. Turned into our parking lot and heard a VERY loud crashing noise. Hmm. Oh well, that was just the ice falling off. Or was it? Nope. A rather large piece of our car was lying in the road behind me. Oops. Backed up, retrieved said piece and proceeded the rest of the way home to inform hubby. how much damage had been done. Apparently ice had built up behind the covering that goes the entire width of the car between the wheels and the engine which made it come into contact with the tires and it snapped off, leaving some of the engine wiring open to the elements. Of course it's plastic (isn't everything?). New part has been ordered and car goes to the spa on Wednesday morning. They say that the Lord giveth and He taketh away (or in today's case he tooketh before he gaveth) but the mail that came after the car issue yielded the dreaded application for the Canada Pension for moi (yes I reach one of THOSE birthdays this year!!) and, wonder of wonders, they're going to give me a little bit of money every month if I can manage to figure out how to fill out the silly forms! Who knew? currently working on (one on each purse). like flowers? Men don't like flowers. I've been wearing a great scent. see that these three sections actually join. yardage to be found in blouses and shirts! These should keep me out of mischief for a few weeks! My computer is going to be headed for the doctor for a few days so I will be offline til it's fixed and updated and otherwise monkeyed about with. I feel withdrawal pains already and it's not even gone! Whatever will you people get up to while I'm gone? It will be a needle roll of sorts when it gets finished and currently measures approx. 4 x 34". The picture on the left shows the two ends. adding more embellishments as I go along. This will (hopefully) be one of the pieces that will be going along when I do the trunk show, provided I get it done in time. More white, and mystery project? Above is the latest bit I've done on my white wrapping cloth project. To the right is the beginning of another project. Hmmmm......I wonder why it might be going to turn into? Any guesses?? A quote for the day... This one is attributed to Virginia Satir.... "Life is not the way it's supposed to be. It's the way it is. The way you cope with it is what makes the difference." 1. Karen is offering her latest on-line class called 'Simply Stitch 4'. This time her format is slightly different but we will still be treated to seeing her work up close and be part of her embroidery and ledger design process. Go HERE for further information. 2. Jackie of Dog Daisy Chains has just announced her very first on-line learning class 'From Fibre to Fabulous'. How I wish I had more hours in the day so I could take this class because it sounds wonderful. Go HERE to read more! that sounded like a prayer. He asked her what she was doing. I just finished knitting this set the other night. The cowl is the 'Austin Cowl' pattern, the fingerless mittens are from the 'Mom's Cabled Mitts' pattern, and the hat is the 'Cathedral Hat' - all found on Ravelry. The yarn is Red Heart Boutique Unforgettable in the Echo colourway. Two balls were plenty to make all three items. stretch to fit the hands beautifully. This one is 'The Harmony Guide to Knitting Stitches' , c1983, published by Lyric Books Limited. There are hundreds of different pattern stitches in this book, all of which are illustrated in colour. This one is my favourite of the two: 'Encylopedia of Needlework'by Donna Kooler; c. 2000, published by Leisure Arts. This book covered in very good detail needlepoint, embroidery and counted thread work. There are over 400 different stitches shown in the book, along with fifteen projects. This was definitely a great addition to my collection/library. of one of the gifts I made for Christmas giving. The quote for today... " Adults are always asking little kids what they want to be when they grow up - 'cause they're looking for ideas". Paula Poundstone. ....all dressed up in their knitted toques and scarves, complete with black top coats! These adorable, and most handsome, fellows were created by Irene and we each got to have one for our very own. us last month. Sue's is in the top left and mine is middle left. love to munch on...oops!!) and therefore up to me to choose what we did. so cute...and easy to create. Thanks Irene and Sue for a fun day! Here's the quote for today....attributed to Ralph Waldo Emerson... "To the dull mind all nature is leaden. To the illumined mind the whole world burns and sparkles with light". Just stumbled across this fabric at Sew Sisters Quilt Shop and must say that it has me interested. 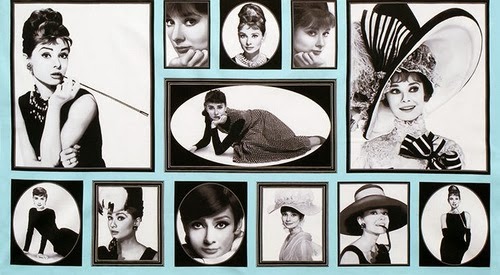 I've always been a fan of Audrey Hepburn so this definitely caught my eye. They also have a another coordinating fabric that has movie posters. There's also a set for Marilyn Monroe. Today's quote is attributed to Martha Mason..."The richest man in the world is not the one who still has the first dollar he ever earned. It's the man who still has his best friend". "If you have made mistakes...there is always another chance for you....you may have a fresh start any moment you choose, for this thing we call 'failure' is not the falling down, but the staying down". Perhaps one or two of my faithful readership (!) might have noticed my absence from blogging for awhile. My creative muse has gotten up and left the building and, with it being so darned cold here, I think it froze up and isn't willing to come back. On top of that, my computer is suffering from hiccups and really needs to go to the computer doctor for a checkup and some medication. I haven't picked up a sewing needle since before Christmas which is absolutely unheard of for me. I have managed to do a little knitting but that is minimal too. Mindless staring at the tv seems to be about all I'm capable of at the moment, which is definitely NOT me either (normally I hate tv). It seems my normal February blahs have hit early this year. This book caught my eye for two reasons...it's about crazy quilting AND I love the hexagon quilt that is shown throughout the book. I would love to do one at some point. I have coveted this book ever since I first saw it reviewed on the internet. All the instructions (and very detailed ones too) are in the book for not only making this lovely little house workbox, but also for a matching needlebook and eight other charming sewing accessories. I don't think I have ever seen a book with such detailed instructions for every step along the way. Love it!